Now we are talking. Those parts will be there as soon as you hang up the phone, OMB is quick. What are you going to do about the scrub brake, it doesn't look like it works in the pic. It worked when I used to go flying down the hill behind the house, just riding the frame, when I was a kid! At the moment I just rotated it around so it stopped dropping down to the floor. 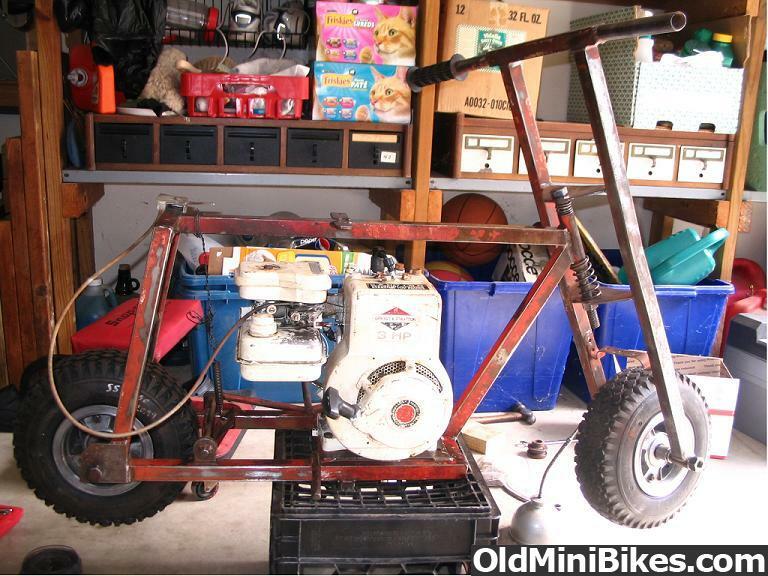 When I get it up and running, I plan to try and see how well that works before most likely opting to go to a drum brake in the rear. And then it'll be onto appearance, paint, etc. But the thing is, when I got this thing, the rear sprocket (60 tooth), was mounted to what appears to be a sprocket-drum combination, with the ability to remove the sprocket. I think? I'll post a pic of it in a bit. That's why I suggested trying that. Ok, didn't know that. yeah you got the good one where you can change out the sprocket. You might be able to get parts to fix. Sorry, forgot to explain that earlier. Correct me if I am wrong, this is a brake drum, right? Just want to be sure, haha. 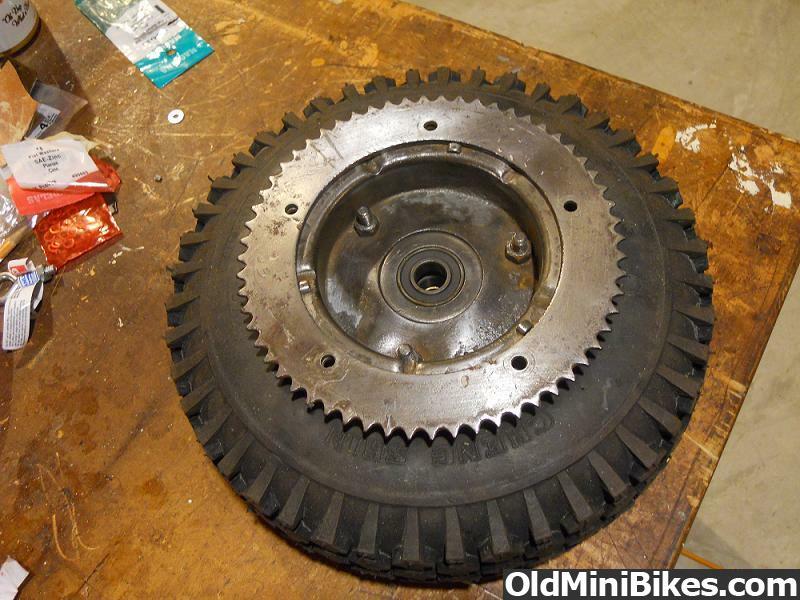 The sprocket was spaced 5/8th's of an inch from the drum, using a stack of old washers with a machine screw going through them (didn't take a pic of that). It looks like it to me. I am no expert though. Sprocket is about shot and I don't think those bolts and nuts inside the drum area look right. I know that much. Hopefully someone that knows something will help ya our. might make a post asking for brake help. Hmm. Just curious, what makes a sprocket "shot"? Is it too warn in the teeth? The tri-star wheel isn't evident in the picture. What would be better to hold them together rather than those bolts? 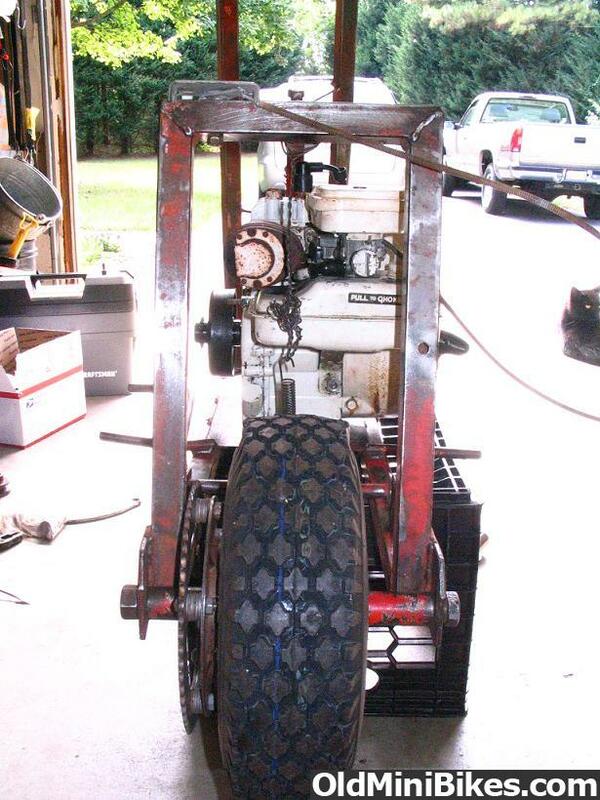 that prob isnt a machined brake drum but may still work. the bolts go the other way. replace that wore sprocket. it will ruin your new chain. 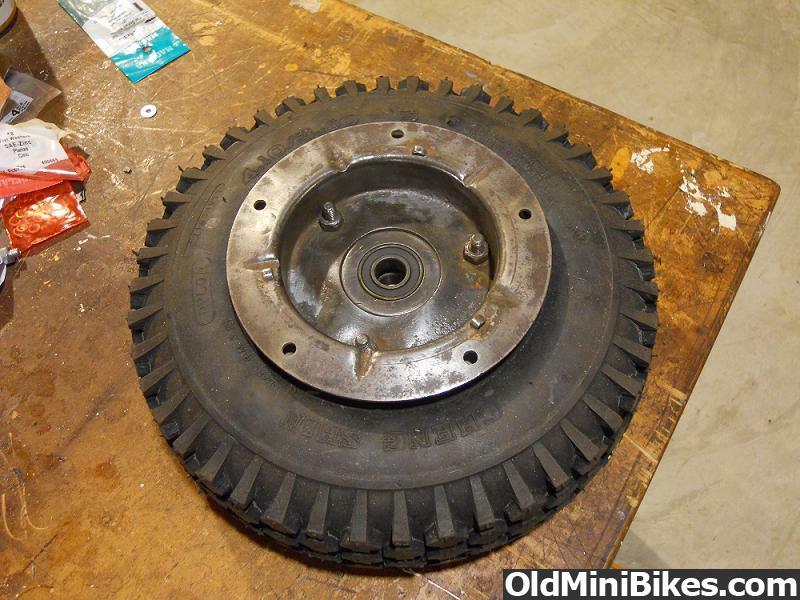 Look at a new sprocket on OMB. It isn't pointed like a saw tooth, it is rounded, and there is more material in each tooth. Not being an expert, I just have one bike with a brake drum, and there is a brake shoe assembly that goes inside the wheel. It is fixed so it doesn't move, the drum spins though. With those bolts sticking up like that I don't think it will work, they will hit the brake shoe assembly I would think. Ran into my first problem. My engine, model 80202, has a 1-1/4" shaft on it. The centrifugal clutch I ordered doesn't have a keyway that goes all the way through itself. It stops half way. Looks like the motor has a bolt on the end of the shaft. You might be able to add a spacer to fill the gap and a big washer on the crank bolt to hold the clutch on. 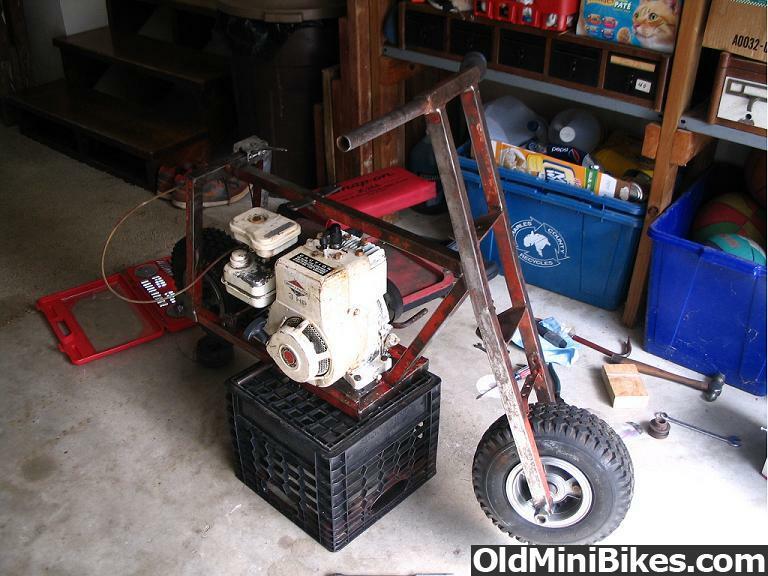 So I said I would get some pics of the minibike with the engine on it, so here it is. Sorry for the lack of picture quality, my newer camera isn't working well, and I found my old camera and got a few pics. I still need to order a new rear sprocket, but I think the 3rd pic (from the rear), shows how the front and rear sprockets don't line up. So I am still working on a fix for the short shaft on the engine, so I can run the centrifugal clutch on the inboard side.